More and more I visit Berlin, the more I realize that speaking German is not an asset but a necessity. The very rare occasions when I manage to ask or say a complete idea in German, without sounding completely out of it (still retaining a terrible accent I’m sure) I usually get much more positive responses from people in Germany. When you go somewhere, try to learn at least 100 words to get by, or show that you are interested. It goes a long way, and people are much more keen on helping you, even in English, after you made the first steps in their native language. As for that nice building, it is the parliament. It represents the German democracy; it’s huge (German bureaucracy too!). It is not too much of a detour if you go to Berlin and is definitely worth a small glance as Berlin isn’t really well known for its buildings (being one of the most bombarded cities of the last century) and this one definitely stands out. It was used from the late 1800s to 1933 where it was left derelict after a fire damaged it. After reunification in early October 1990 it’s renovation was started and completed nine years later in 1999 (an attempt was made in the 1960s but they just made it so it was protected against the elements and not restored for use. It was dedicated to the German people. 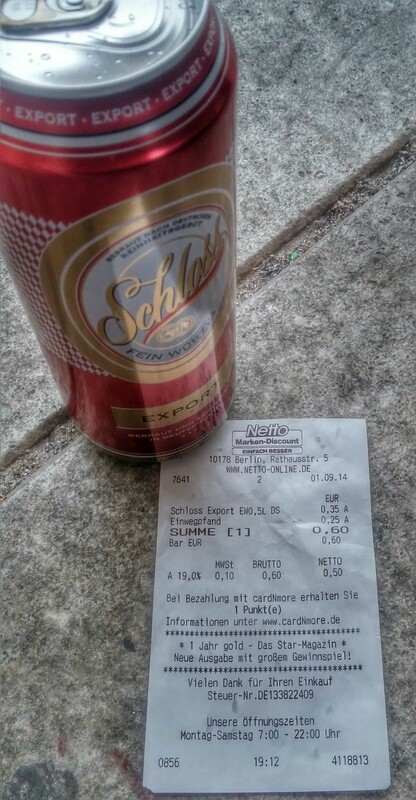 Also, today is a grand day, as today I purchased my first 0.35€ beer. That is correct. 35 cents. To top it off, it’s probably as good as most good standing American commercial beers. It’s also kinda bio (compared to American beers) as German beers are heavily regulated as are the ingredients that are used in their production. Funny thing is the deposit is only 0.10€ cheaper than the beer itself.